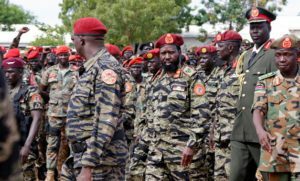 The government of South Sudan has rejected a proposal to dissolve the security sector for it to be reconstituted and transformed into a national and professional army. Inofrmation minister Makuei Lueth said this while speaking to journalists in Juba on Sunday after the return of the government delegation from Addis Ababa Ethiopia, where the South Sudanese parties have been for the Second Phase of the High Level Revitalization Forum (HLRF) on the Agreement on the Resolution of the Conflict in South Sudan, 2015 (ARCSS). According to Mr Makuei, the government cliams that dissolution would create “statelessness” during the establishment of the proposed army. “As you know the government delegation went to Addis Ababa with commitment to ending the suffering of the people but the opposition groups united themselves with one position and demanded the dissolution of all institutions of governance in South Sudan, including the security organs and that is impossible,” said Makuei Lueth. “The opposition groups are saying let’s dissolve the security organs and that the security should be taken over by UNMISS (United Nations mission in South Sudan) and RPF (Regional Protection Force). We did not fight to hand over the government to others. They are advocating for statelessness, which is unacceptable. As the government, as people, we will not allow. We object it,” minister Lueth added. The mediation in Addis Ababa suspended the talks on security arrangements and power-sharing, after the parties failed to reach a compromise on the outstanding issues. However, the mediators said significant progress had been achieved during the 11 days of talks. The information minister and spokesperson of the government negotiating team said their delegation, also, rejected a proposal for the creation of the two armies, saying the clashes at the presidential palace in July 2016 have shown the negative impact of having two armies. “So we are not for two armies, even the opposition is not also for the creation of two armies,” he said. In addition, he said they rejected a proposal by the East African regional bloc IGAD to allow the president appoint four vice presidents for inclusivity in the government. “We have not agreed on the governance and the system of governance. The government is saying we are maintaining the status quo and we are creating positions in the second layer, and that is the positions of presidential assistants,” he said. “The opposition also talked of establishment of the office of prime minister who will be an executive prime minister. This is a system which is alien to us and we are not for it,” he stressed. He accused the opposition groups of creating obstacles that prevented reaching a deal on Friday. “The government delegation was not the problem and it will not be the problem”, he added. “They (opposition groups) are demanding that (President) Salva Kiir and his government must go and this is an impossible position, so the problem is not with us,” he added. The information minister said that the government delegation also rejected a clause in the declaration of principles calling for punitive measures against spoilers of the peace process. “This article was brought from outside. It was brought by Americans to be specific, by the Troika and the European Union. We are not for that provision and we are not ready to license anybody so that he can do whatever he wants to do,” he said. He urged the people of South Sudan to be patient as the government and opposition groups negotiate to bring about peace in South Sudan. “The people of South Sudan should not get angry. People should be patient because peace is coming soon,” he said. The mediators and facilitators presented two texts reviewing the dispositions of Chapter I on the power-sharing and Chapter II on the security arrangements. When the forum resumes at a later date, the IGAD chairperson and Members of IGAD council of ministers will engage the South Sudanese parties and intensify their efforts to assist them to make the necessary compromises that will resolve the outstanding issues. The IGAD Special Envoy for South Sudan, Ambassador Ismail Wais and the IGAD facilitators will undertake specific missions related to this endeavour. On the basis of these consultations, the forum will be reconvened to complete the deliberations.